The Philadelphia Archaeological Forum working with other organizations at the Bethel AME burial ground beneath Weccacoe Playground in Queen Village. The Philadelphia Archaeological Forum (PAF) is a non-profit organization dedicated to the protection and preservation of archaeological resources in the City of Philadelphia. 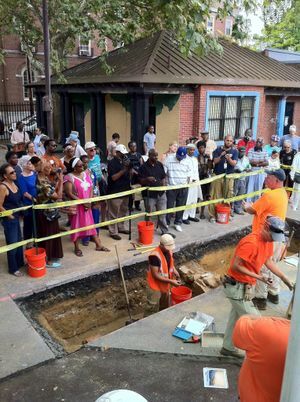 Established in 1998, the organization aims to further an awareness of Philadelphia’s rich archaeological heritage through educational programs and activities which reach beyond the professional community. PAF also advises agencies and the general public on archaeological matters and encourages communication about, and support for, the publication of information concerning the archaeology of the city. The Philadelphia Historic Preservation Task Force. The Certified Local Government Evaluation Report. The Day of Archaeology Project. Note: The above descriptive information came from the organization's PAF Activities page. This page was last edited on 7 March 2019, at 13:53.